Moomist Villa is an idyllic setting to relax and rewind. It is located within Polynesian Gardens across the street from beautiful Siesta Key beach (Number 1 on the list of Top 10 most beautiful beaches in the USA). Out the front door you have a “peek-a-boo” view of the bay with boats cruising by. Out the back sliding doors you look on an ancient oak covered with resurrection fern, orchids & bromeliads & a stone path to your own private hot tub in the middle of the jungle of tropical flora. When you walk in the front door you will be captivated by the arched ceiling painted to look like the sky. The living room is charming & tropical, the sun porch/TV room is comfy and cozy and has a sleeper sofa. The kitchen is properly “beachy” with open shelves & bamboo countertops. The master bedroom with a queen bed & wicker chests is a sanctuary ala Tommy Bahama style. The second bedroom has twin beds and is bright & Floridian. The unit is fully furnished & equipped. It has 3 TVs, VCR player, stereo system, etc. There is wi-fi access. The community fishing pier is at the end of the street & the heated pool is around the corner. Walk across the street to miles of white sugar-sand beach (1/3 mile -- or take the free trolley that will drop you off at the public beach). Walk (or drive) ½ mile to quaint beach pubs and convenience stores. ACTIVITIES & ATTRACTIONS: Beaches, pool, shelling, fishing, water sports, boating. Shopping, restaurants, cultural activities – something for everyone! GOLF -- over 40 public courses in the local area. 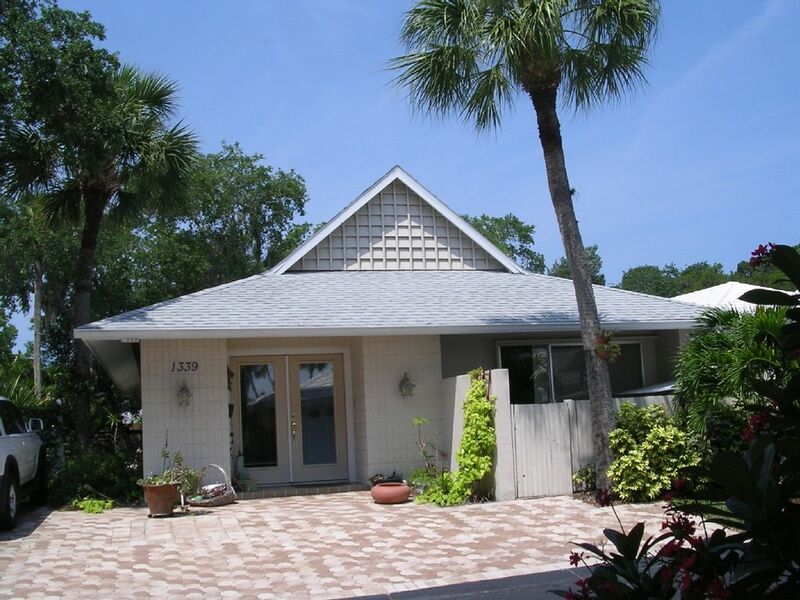 It’s just a short walk or drive to Crescent Beach and Siesta Key Beach. Or you can grab the free trolley that runs the length of the key. Island style restaurants and pubs are also a few blocks away. A 15 minute drive will have you in downtown Sarasota and 20 minutes will put you on world famous St. Armand’s Circle for world class shopping and dining. Sarasota is renowned for it’s many cultural activities including the Ringling Museum (if you’ve never seen a Rubens up close – WOW! ), the Van Wezel Performing Arts Center, Asolo Theatre, Sarasota Opera, Florida Studio Theatre, Players Theatre, Selby Botanical Gardens (orchids, orchids, orchids!) Mote Marine (pet a sting ray). Also short term membership at Bath & Racquet Club is available for tennis & gym. NEARBY ATTRACTIONS: Fly into either Tampa or Ft. Myers – we’re just over an hour from either airport. We’re less than 30 minutes from the Sarasota airport. It’s only 2 hours to Orlando (Disney, MGM, Universal Studios and Sea World). It’s about an hour to Tampa (Busch Gardens, NFL and NHL). It’s about ½ hour to the Ellenton Prime Outlet Mall with over 130 outlet stores. I grew up on the beach in NC and now live on the beach in Sarasota -- always a beach girl. There's something about being near the sea that is good for the soul. Across the street from the famous Crescent Beach. Take the free trolley or one of the many "ride shares" to the public beach. Some books in villa and a lending library at the clubhouse. Private hot tub -- outside under the grand oak. Kitchen is fully equipped. Short term membership at Bath & Racquet Club is available for tennis and exercise. Wi-fi connection is available. My husband and I thoroughly enjoyed our 3 week stay at Moonmist Villa. The house had a tropical feel and was spacious. We loved the intercoastal dock and the proximity to Siesta beach and to Siesta Village. A wonderful spot to stay! Home was very clean and comfortabl. The hot tub was a great addition. The home was great, everything we needed as an adult family. Hot tub was a nice addition. Location was great. Very comfortable. We found access to the beach somewhat challenging but we were able to find our way through other properties. We would certainly return next year or in the future. We really enjoyed our stay in Siesta Key. The house was very cute. It is located in a tiny little development right off the main road, very close to the bridge that takes you back to the mainland. It almost feels like a little oasis as you pull off the main road and into this little cluster of homes. There is a pool in the middle of the development, a very short walk from the house. I only heard about the walkway to the bay later, as we felt so insulated i our little nook that I didn't realize that the bay was a stone's throw away. I wish I would have found the path. The house was priced well, clean, and accessible. The owner instantly responded to any question that we emailed to her. We had an issue with one of the toilets (master bedroom, not flushing fully), and although it wasn't fixed during our stay, it wasn't enough of an issue to sour me on the house or the owner. You can walk to the beach, which requires cutting through another development - supposedly it isn't an issue - though we drove to another beach on Siesta Key where friends were staying. The sand on the beach was unbelievably nice. It was white, powdery, and cool to the touch on a very hot day. This house is not a walk to the main downtown area. If you are looking for that, this isn't the house for you. We had a car, so we didn't care. We actually preferred being near the bridge, as you can find every store or restaurant that you need about 2 minutes from the house. The main drawbacks are ones that didn't bother of affect us. For example, if you don't want to have to cross the main road and cut through another development to reach the beach (or drive 30 seconds to the public beach), that could be a deal breaker. If you want to be able to walk into town, that could be a deal breaker. But we loved the little development and thought the house was cute. And as I stated earlier, the quick access to the mainland was nice. My family enjoyed our time in Siesta Keys and we loved the Villa. It's very roomy and has everything you need to enjoy your stay. We loved fishing on the pier and we actually caught fish every night. The swimming pool in lovely also. For the price we paid this was a great deal. The rest of my family (staying in other condos) were very jealous. We had a wonderful time staying in Moonmist. It was well stocked with everything to make our beach stay perfect. Spending evenings on the community dock fishing was the perfect relaxing place to end each of our days. Thank you for sharing your place with our family. Very clean, very well-organized. We didn't miss anything. Good place, accessible to the beach. Everything was pleasant, enjoyable and relaxing. The Jacuzzi in the back yard, the nearness of the pool, shopping, etc. was very accessible. $300 security deposit/reservation deposit There is a ONE WEEK minimum rental period!! No 'weekend' rentals.